NEW TEST ANNOUNCEMENT | Hematologics, Inc. Presence of the T-alleles has recently been correlated to resistance to treatment with Gemtuzumab Ozogamicin (GO; Mylotarg®)1. The presence of CD33 non-synonymous coding single nucleotide polymorphism rs12459419 (T-allele; CT/TT genotype) has been associated with expression of alternatively splice variant of CD33. In contrast, a CC-genotype for CD33 rs12459419 has been correlated with full-length expression of CD33. Patients with a CC-genotype may benefit from the addition of Gemtuzumab Ozogamicin to chemotherapy. 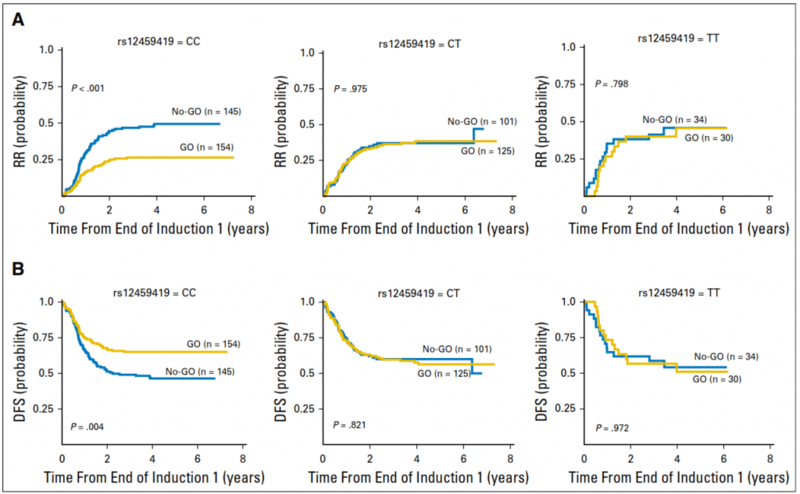 Homozygous C>C allele allows the use of Gemtuzumab Ozogamicin (GO; Mylotarg) as an option for treatment of AML, while heterozygous C>T or homozygous T>T patients will not respond due to lack of CD33 binding site.